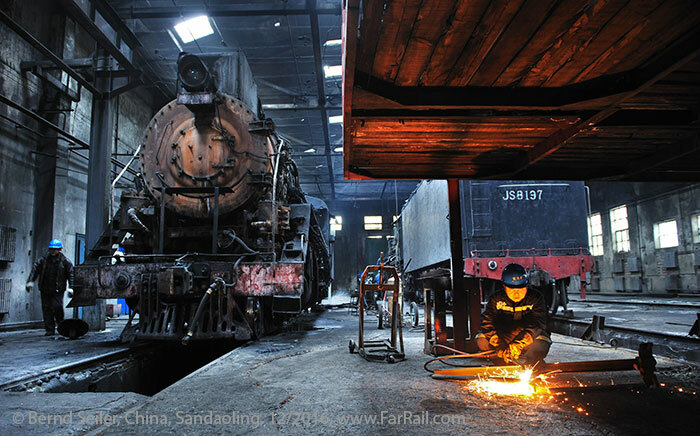 It depends on whom you ask, when you try to find out the date for the end of the steam service in Sandaoling. 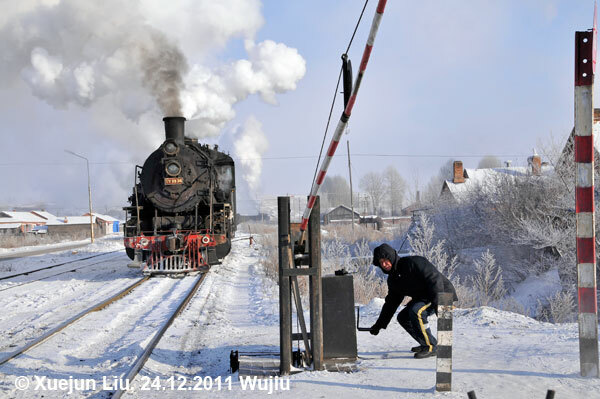 The manager of the workshop was quite sure that after Chinese New Year (January 28th) the locos will remain cold. But on January 7th, I received a message that the management have decided to run steam for a few months more. The consensus seems to be May 2017. 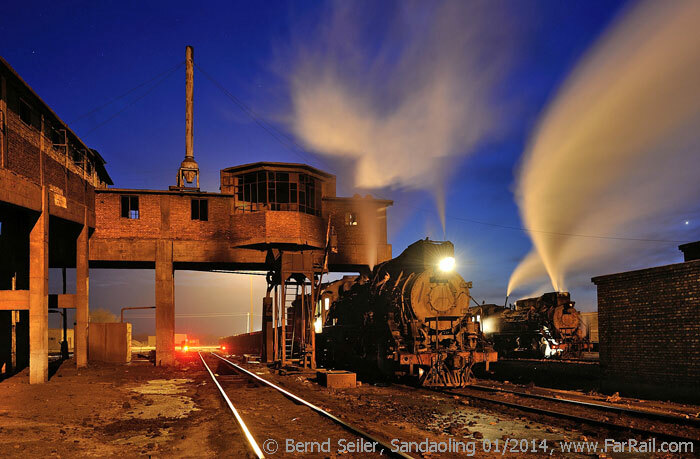 It is difficult to combine Sandaoling with any other worthwhile steam location in China. 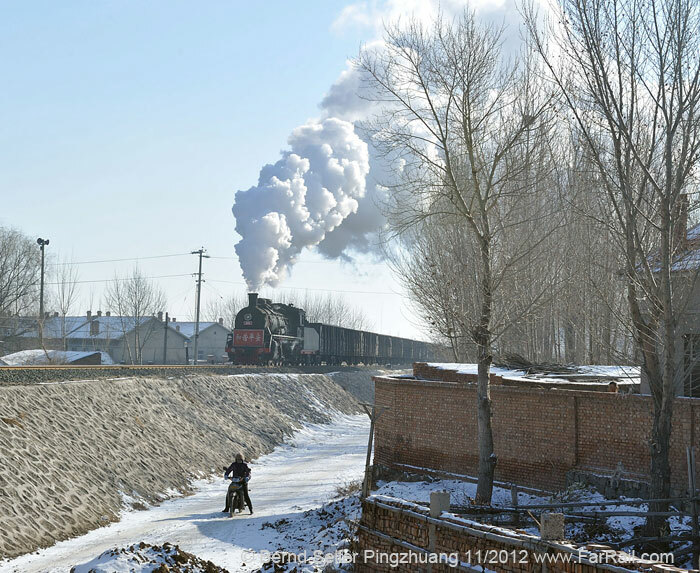 Pingzhuang used two SYs in December 2016, but after Chinese New Year, they’ll not resume traffic any time soon because the demand for coal is low and they already have much stockpiled coal for sale. 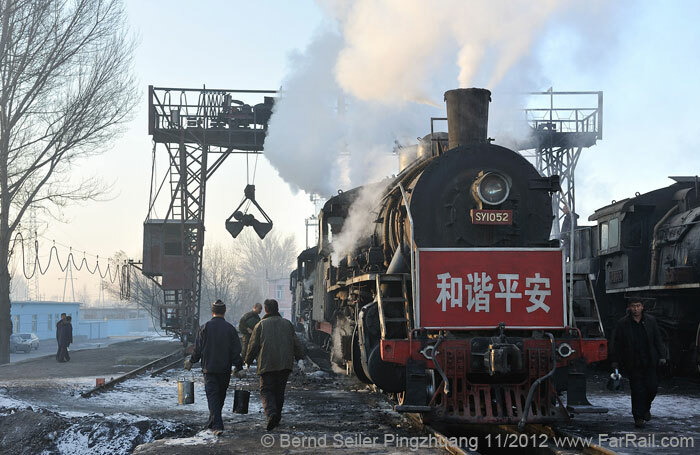 The one loco in use in Wujiu, far in the north, sometimes sits idle at the stabling point for a couple of days …. and if it runs then it’s tender first uphill. However, I tend towards Wujiu for the second place to visit. Due to the uncertainties, we’ll decide where to go after we’ve arrived in China, on Febraury 12th. 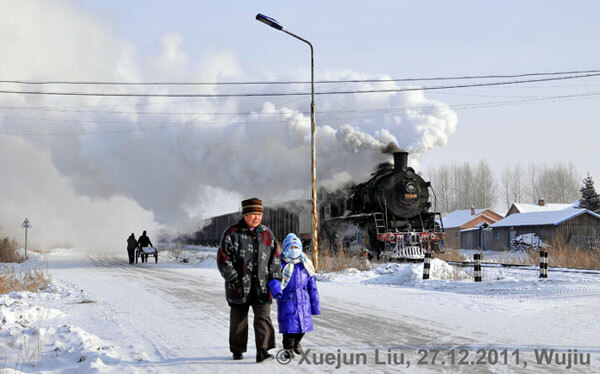 This tour represents the very last chance to see regular winter steam in China. The question is now, not whether they’ll stop the steam service, but merely when the last shout of a steam loco used in real service will die away. And this is exactly what the locos in Sandaoling are doing dailly: roaring against the gradient. This tour doesn’t have a classic itinerary. We’ll stay flexible to make the most out of the fading opportunities. And there is no guarantee that we will succeed. But if no disaster happens, I can assure you that this will be the end of real, hard working steam! The dinosaurs of the age of industrialisation are almost extinct. 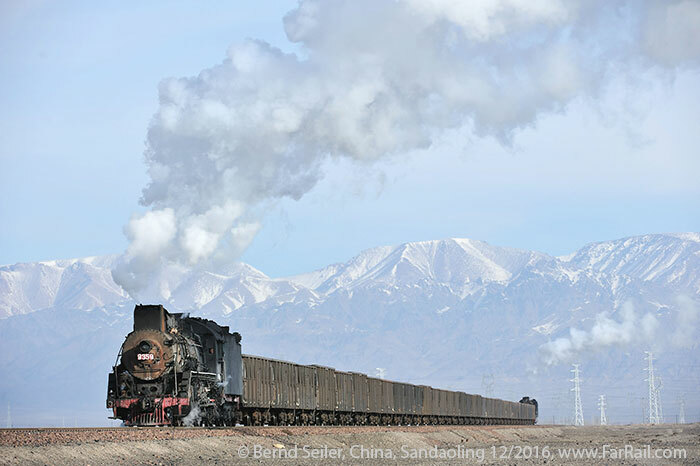 But Sandaoling was still using nine steam locomotives in December 2016. 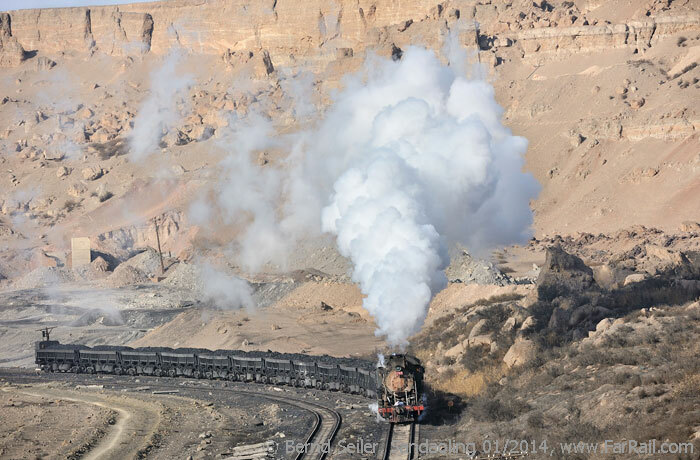 There are a few more steam locomotives scattered all over China, but at locations with one or two shunting locos, rarely moving and, at best, producing boring situations in endless yards and on short links to industrial sites which are either inaccessible, not photogenic, or both. 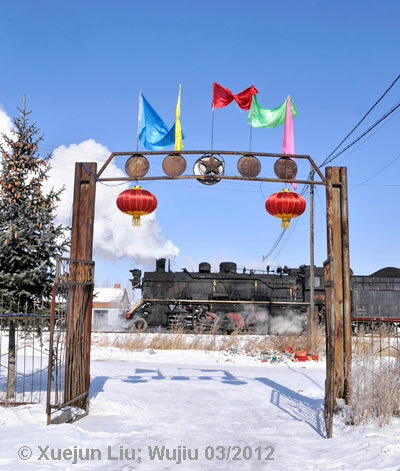 The narrow gauge line of Shibanxi is a tourist Mecca and, in my opinion, you would be better going to Wales if you want to see a properly preserved line. The plastic and, sometimes, colourful wagons in the trains are hardly worth the long journey down there. 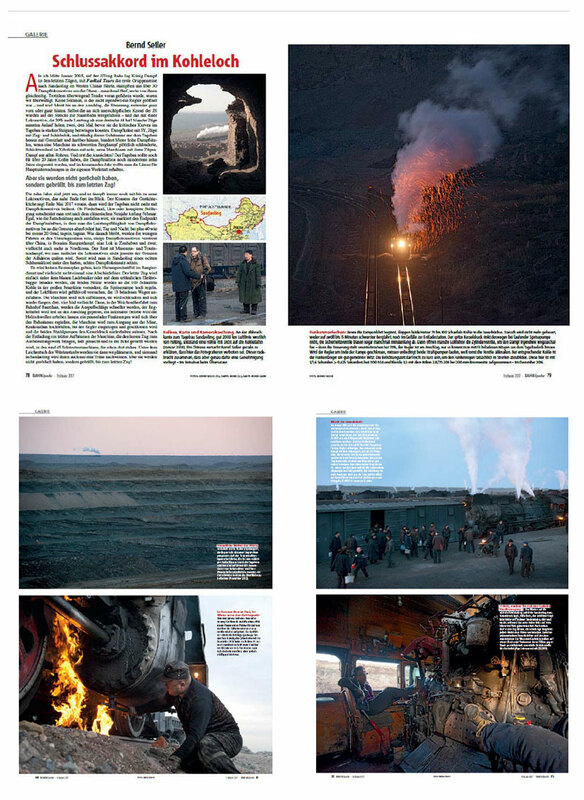 However, the last really worthwhile location still offers steam at its best, fighting against the physical limits of adhesion, they climb steep gradients with their trains of coal. 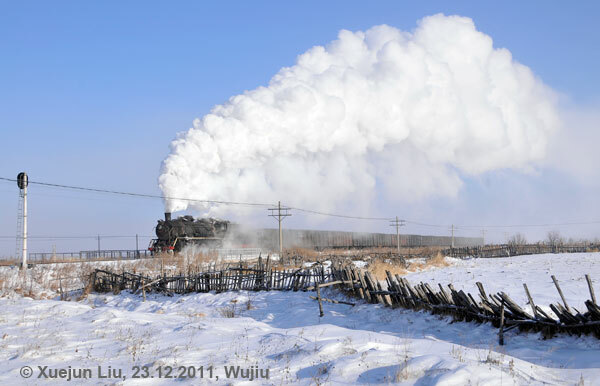 Recent winter tours to China which I’ve considered to be the last, have turned out to be extremely successful, especially from the photographic point of view. 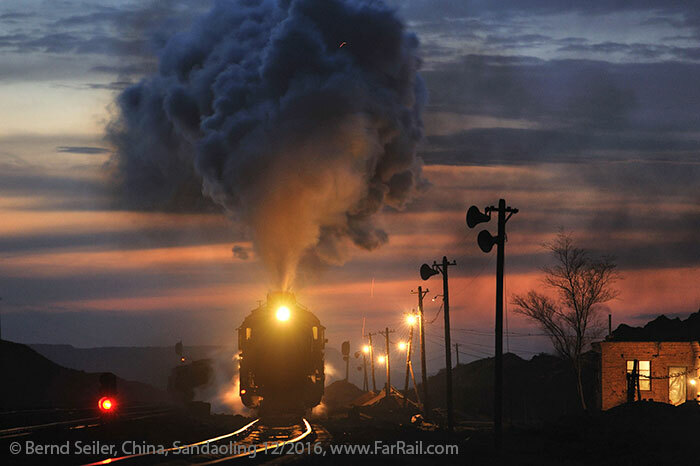 It’s amazing what the dusk of steam can still produce for memorable moments and grandiose video sequences. 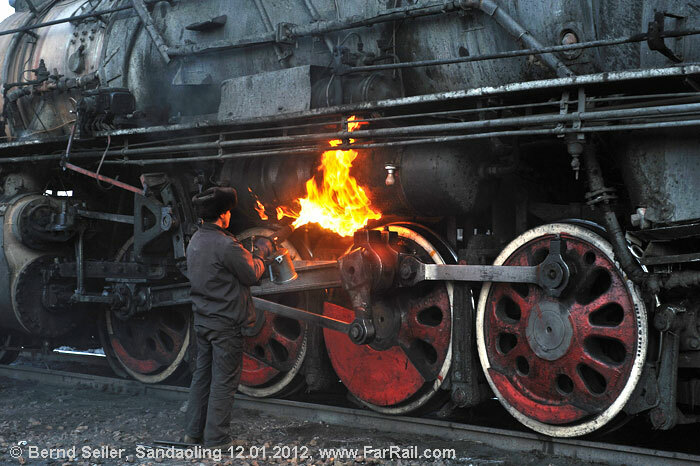 Sandaoling offers the 2-8-2-locomotives of Class JS, way more powerful than a Black Five for instance …. hence their fantastic sound. The other possible locations run the class SY, a lighter 2-8-2 design. I won’t say anything about the “last” tour to China anymore. This final steam is so good that it’s likely I’ll continue to offer these places until diesels have taken over or the last track has been lifted, which is the very close future of Sandaoling. 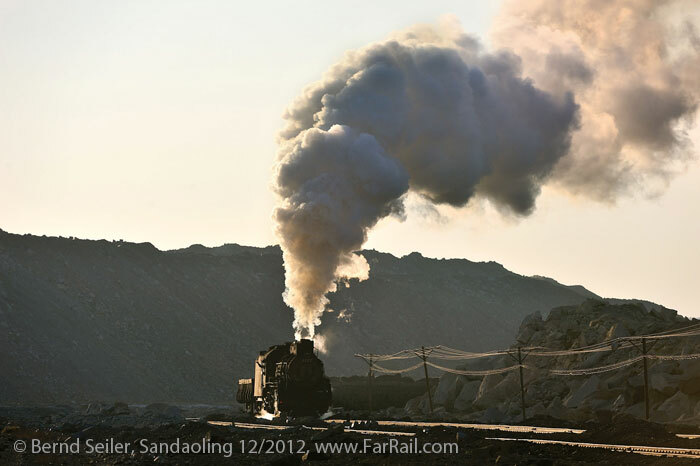 It’s not certain that Sandaoling will still be running all nine steam locos in February 2017, but the odds are high that they’ll not finish steam before May 2017. 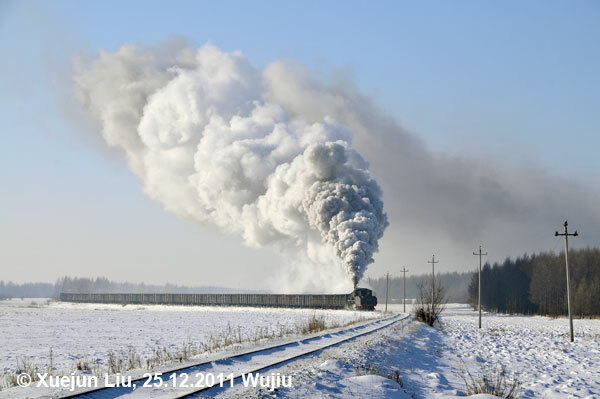 No matter whether you’re a newcomer to steam in China or a well experienced gricer who just wants to say goodbye to the era of steam, this tour is made for all your needs. Arrival in Beijing by 15.00 hrs and then we’ll decide where to go to. Either we’ll book a hotel and take the early morning flight to Hami on Feb 13th to continue to Sandaoling or we’ll go to Wujiu or Pingzhuang. We’ll inhale the last real steam and produce great pictures and videos about it. In Sandaoling and, maybe, in another location, too. First of all, we are at the brink of a steam-free age, we can’t rule out that some of the lines on the list may have changed to diesel locomotives before we arrive or have even closed down completely. The itinerary is based on all available information from January 2017. There is no substitute if a line is dieselised or closed. No guarantees and, virtually, no refunds are possible. 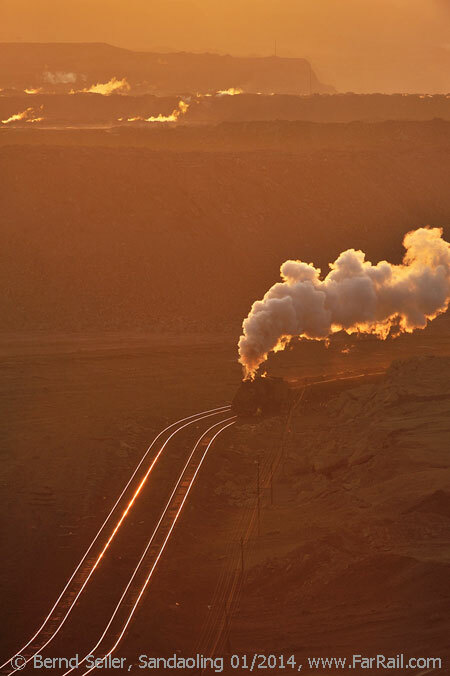 But as usual, we’ll make the best out of the opportunities and change arrangements to see as much steam as possible. 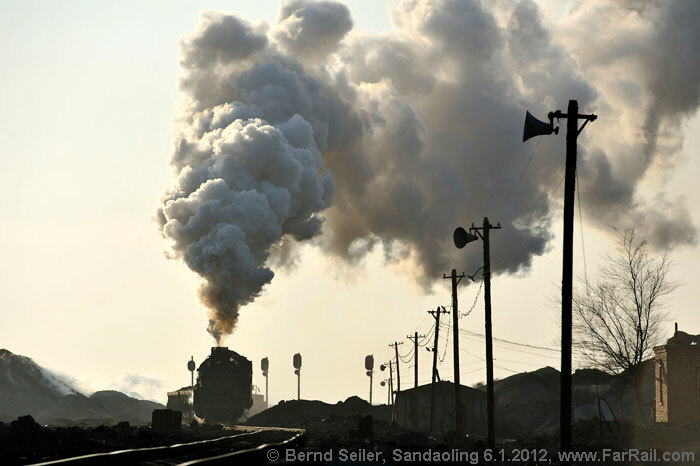 Sandaoling has become the Mecca for railway enthusiasts. 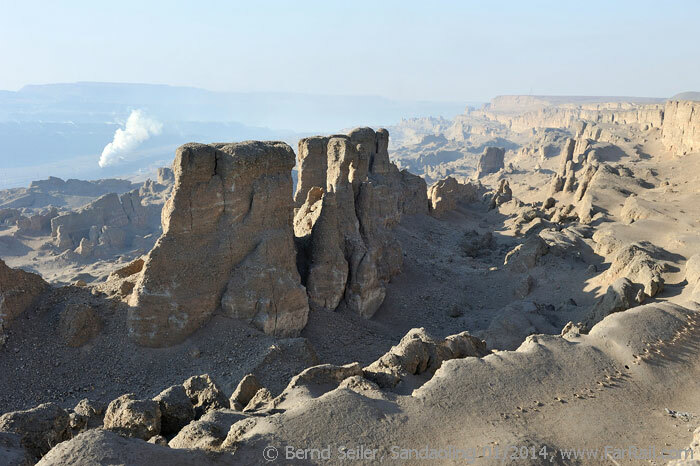 In the moon-like landscape there are plenty of photographic opportunities. The time we’ve planned for the visit to the steamiest hole on earth won’t be boring. We’re sure that you’ll still find new positions on the last day of our visit and may think about extending your stay rather than leaving earlier. 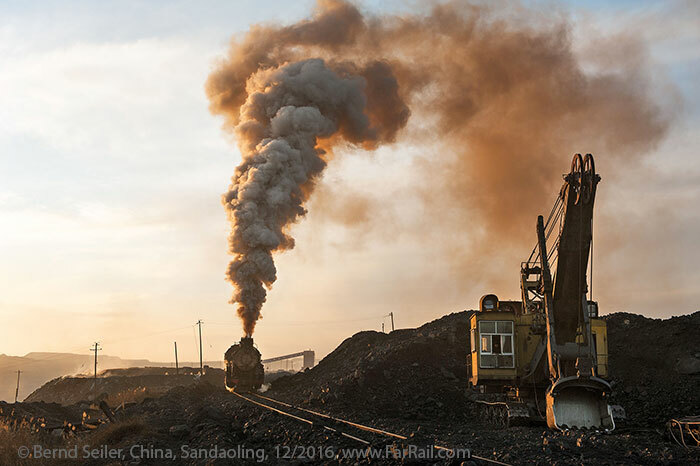 All coal trains from the loading facilities deep in the pit need to climb out of the open cast mine to reach the unloading points. This is an almost 3 miles thrash for the heavy trains. In the best case you can witness this spectacle about every 20 minutes to half an hour. Sometimes there is a gap of up to four hours, but then it starts again! 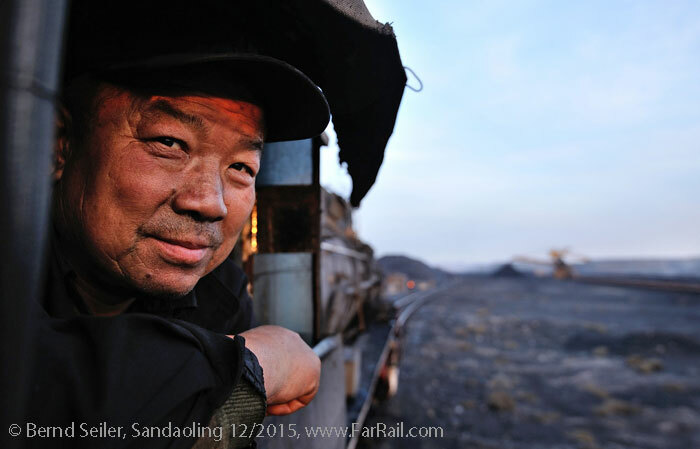 Most, if not all, of the coal trains are hauled chimney first out of the pit. The pushed trains in the open cast pit are “push-pull” trains with a small signal cabin built on the platform of the last wagon of each train. With a semaphore on the roof of these “cabooses” the loco driver gets the signal forward. This is an unusual operation pattern in China and well worth photographing. Sadly, Xibolizhan is now a deserted station with a huge parking area for lorries. Sunsets in Sandaoling can be amazing as well. There are quite a lot of reasons to go there but the main reason is that normally there are nine hard working JS’s in the area, four of them used in the pit. A visit to the workshop is, again, possible. They’ll charge you about 150 Yuan for the visit. We’ll check whether there are locos in the workshop or not before we go in. In the open cast mine there are several cameras, so an unauthorised visit is not recommended. But we’re allowed to walk down to the station of Baerzhan. On this section, from the unloading points to this station inside the pit, you can take dozens of good shots. We found that the monitoring of railway enthusiasts has eased in the last year. They’ve reduced the number of staff and security. But as we left the mine in December 2016, a group of enthusiasts arrived and jumped over the tracks just in front of a moving train. A couple of days later the police cleared the place of railway enthusiasts, including the station of Dongbolizhan. So please behave safely and never walk into the profile of an approaching train! For now, Sandaoling is still the greatest steam show on earth. The performance still goes on, however. 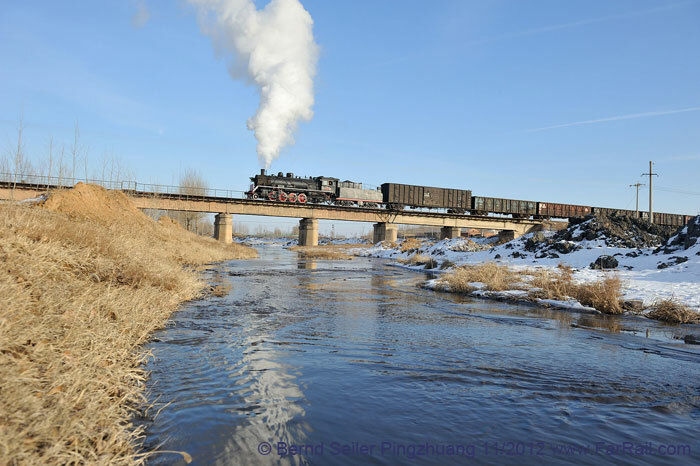 probably in May 2017, Sandaoling will dump all their steam locomotives. It’s expected that a decision about the final date will be made during February 2017. Just in case we'll go to Pingzhuang or Wujiu here are some pictures of these locations. This tour was planned in January 2017. Nevertheless, it is not certain that the lines will still have steam. In the unlikely case that one line is dieselised or closed before we arrive, we will make different arrangements to see as much steam as possible. 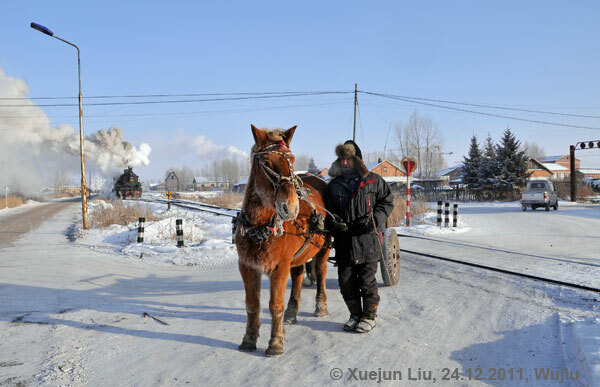 We expect a morning temperature around minus 10 to minus 30 degrees Centigrade in the north and around zero degrees Centigrade in the western part of China and Beijing. The photo equipment usually has no problems with these temperatures, it’s only the batteries. When not using them you should pack them in a warm place. We can warm up in our charter bus any time, so it’s not too difficult to stand the hard winter with the right clothing. The recent winters have been very mild during our stay in China, afternoon temperatures up to some eight degrees above zero are possible as well. This tour is designed for both dedicated photographers and video film makers. Our philosophy is to provide opportunities to get that perfect sunrise shot rather than a time consuming 5-star breakfast buffet (which is not even on offer in such remote places we’re going to). Breakfast and lunch may be served as a packed meal. Dinner is planned to be a proper (Chinese) meal. Times for meals can vary. Beverages are not included in the tour price. We’re planning to do some night shots. Please take an appropriate tripod with you. Yes, even in the digital age a tripod does help a lot when it comes to tricky light situations! Hotels, charter buses and trains represent the standard of our host country, which may deviate from European or North American expectations. The hotels used will be of medium class but in remote areas, i.e. Sandaoling, it is very basic. A hot shower and a private bathroom and internet are available everywhere. While we will endeavour to avoid long walks, some photo positions may require an extra but worthwhile effort. If we use an overnight train, we’ll try to book everyone in soft sleeper class (four berth compartments). It is not guaranteed that we can get soft sleeper tickets, but it’s very likely. In an unusual case, we’ll use hard sleeper class, which, however, is not as hard as the name suggests. Hard sleeper compartments are open and normally comprise six berths. Single bed compartments are not available on overnight train rides. You don’t need to pay a deposit when registering for this tour. There is no registration deadline for this tour either. This is the former China tour, now an extension to North Korea.